This image was among those selected and on display at Filoli Garden's 2014 "Bay Area Wildlife Exhibit". The manmade lake at Shoreline Park, Mountain View lies adjacent to the marshes and wetlands of San Francisco Bay and is a haven for wildlife. Home to wide variety of birds, it is a regular stopover for the thousands of migratory birds that traverse the Pacific Flyway in the spring and the fall. Birds you might see are ducks, American avocets, black-necked stilts, barn swallows, sandpipers, terns and white pelicans, along with more unusual creatures like jack rabbits, foxes and burrowing owls. Black skimmers are one of the more noticeable birds and when spotted in residence at the lake, attract many photographers. 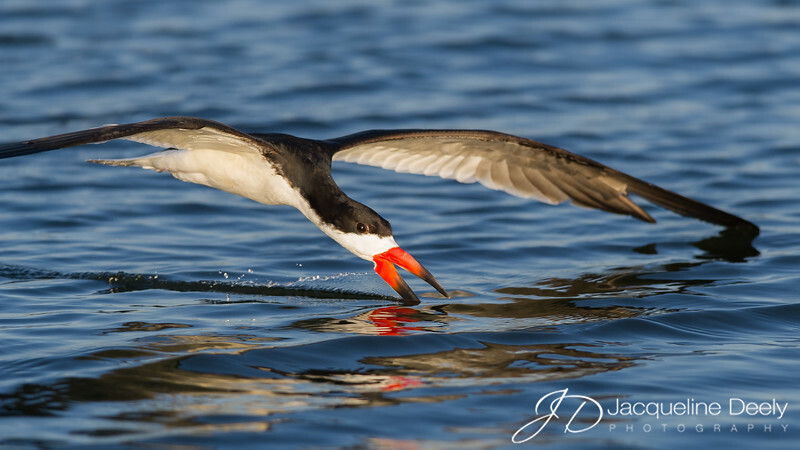 The Black Skimmer has one of the most unusual foraging styles of any North American bird. The remarkable, large red and black bill is knife-thin with the lower mandible longer than the upper. A feeding skimmer flies low over the water with its bill open and its lower mandible slicing the surface. When the mandible touches a fish, the upper bill (maxilla) snaps down instantly to catch it. Black Skimmers are not federally protected, but they are on several state lists, ranging from endangered in New Jersey to special concern in North Carolina and Florida. The main threat to skimmers in modern times is development or other loss of their beach-nesting habitat, since they nest on exactly the kinds of beaches that people like to vacation on. In addition to habitat loss, skimmer nests can be destroyed by roaming dogs and by vehicles that are allowed to drive on beaches.